You may already know that the Titanic hit an iceberg at 11:40 p.m. on the night of April 14, 1912, and that it sank two hours and forty minutes later. Did you know that there were only two bathtubs on board or that the crew had only seconds to react to the iceberg? These are just a couple of the interesting facts about the Titanic that we're going to explore. The Titanic was supposed to be an unsinkable boat and it was built to monumental scale. In total, it was 882.5 feet long, 92.5 feet wide, and 175 feet high. It would displace 66,000 tons of water and it was the largest ship built up to that point in time. The Queen Mary cruise ship was built in 1934 and surpassed the Titanic's length by 136 feet, making it 1,019 feet long. In comparison, The Oasis of the Seas, a luxury liner built in 2010, has a total length of 1,187 feet. That is nearly a football field longer than the Titanic. Luxuries for the first class passengers included a swimming pool, a Turkish bath, a squash court, and a dog kennel. The Ritz Restaurant on board was inspired by the famous Ritz in London's Picadilly Circus. The grand staircase—there were several staircases—on the Titanic descended seven of the ship's ten decks, and featured oak paneling and bronze cherubs. A replica of the staircase can be seen at the Titanic museum in Branson, Missouri. The last dinner served to first class passengers at the Ritz Restaurant was a feast with ten sumptuous courses, featuring oysters and caviar; and lobster, quail, salmon. roast duckling and lamb. On board the Titanic were 20,000 bottles of beer, 1,500 bottles of wine, and 8,000 cigars. all for the first class passengers. The Titanic burned about 600 tons of coal each day to keep it powered. A team of 176 men kept the fires burning, and it is estimated that over 100 tons of ash were injected into the Atlantic each day the Titanic operated. Originally, a lifeboat drill was scheduled to take place on board the Titanic on the very day that the ship hit the iceberg. However, for an unknown reason, Captain Smith canceled the drill. Many people believe that had the drill taken place, more lives could have been saved. From the time the lookouts sounded the alert, the officers on the bridge had only 37 seconds to react before the Titanic hit the iceberg. In that time, First Officer Murdoch ordered, "hard a-starboard" (which turned the ship to port—left). He also ordered the engine room to put the engines in reverse. The Titanic did bank left, but it wasn't quite fast or far enough. Not only were there not enough lifeboats to save all 2,200 people on board, most of the lifeboats that were launched were not filled to capacity. If they had been, 1,178 people might have been rescued, far more than the 705 who did survive. For instance, the first lifeboat to launch—Lifeboat 7 from the starboard side—only carried 24 people, despite having a capacity of 65 (two additional people later transferred onto it from Lifeboat 5). However, it was Lifeboat 1 that carried the fewest people. It had only seven crew and five passengers (a total of 12 people) despite having a capacity for 40. When the Titanic began sending out distress signals, the Californian, rather than the Carpathia, was the closest ship. However, the Californian did not respond until it was much too late to help. At 12:45 a.m. on April 15, 1912, crew members on the Californian saw mysterious lights in the sky. These were the distress flares sent up from the Titanic and they immediately woke up their captain to tell him. Unfortunately, the captain issued no orders. Since the ship's wireless operator had already gone to bed as well, the Californian was unaware of any distress signals from the Titanic until the morning. By then, the Carpathia had already picked up all of the survivors. Many people believe that if the Californian had responded to the Titanic's pleas for help, many more lives could have been saved. The order was for "women and children first" when it came to the lifeboats. When you factor in that there were not enough lifeboats for everyone on board the Titanic, it is a bit surprising that two dogs made it into the lifeboats. Of the nine dogs on board the Titanic, the two that were rescued were a Pomeranian and a Pekinese. Among the famous people who died on the Titanic, the wealthiest by far was John Jacob Astor IV, who was worth over US$90 million, over two billion in today's currency. Others included the mining heir, Benjamin Guggenheim, and engineer Thomas Andrews, who oversaw the construction of the Titanic. The co-owner of Macy's department store, Isidor Straus and his wife Ida, also died on board the ship. On April 17, 1912, the day before survivors of the Titanic disaster reached New York, the CS Mackay-Bennett, a commercial cable repair ship, was sent off from Halifax, Nova Scotia to search for bodies. On board, the Mackay-Bennett were embalming supplies, 40 embalmers, tons of ice, and 100 coffins. Although the Mackay-Bennett found 306 bodies, 116 of them were too badly damaged to take all the way back to shore. Attempts were made to identify each body found. Additional ships were also sent out to look for bodies. In all, 328 bodies were found, but 119 of these were so severely degraded that they were buried at sea. Although the official number of the dead on the Titanic was 1,503 (of the 2,208 on board, there were 705 survivors), over a hundred unidentified bodies were buried in Fairview Lawn cemetery in Halifax, Nova Scotia. Many people traveled under false names, and from so many different places, it proved impossible to identify even the recovered bodies. Sidney Leslie Goodwin, a 19-month-old boy buried under the marker "unknown child" was identified in 2008, after extensive DNA tests and a worldwide genealogical search. There was an eight-piece band on the Titanic, led by violinist Wallace Hartley, who had to learn 350 songs in the songbook handed out to first class passengers. As the Titanic was sinking, they sat on the deck and played music, and all of them went down with the ship. Survivors reported that the last piece they played was either "Nearer My God to Thee" or a waltz named "Autumn." 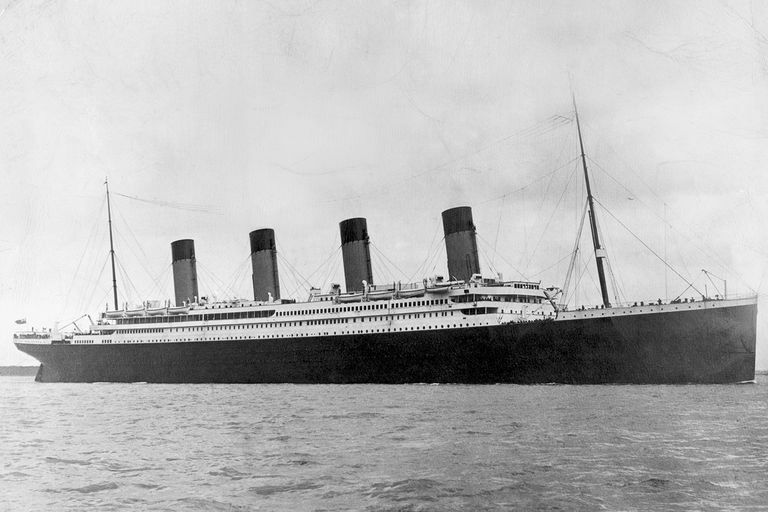 In what is now an iconic image, the side view of the Titanic clearly shows four cream and black funnels. While three of them released steam from the boilers, the fourth was just for show. The designers thought the ship would look more impressive with four funnels rather than three. While the promenade suites in first class had private bathrooms, most passengers on the Titanic had to share bathrooms. Third class had it very rough with only two bathtubs for more than 700 passengers. The Titanic seemed to have everything on board, including its own newspaper. The "Atlantic Daily Bulletin" was printed every day on board the Titanic. Each edition included news, advertisements, stock prices, horse-racing results, society gossip, and the day's menu. The R.M.S. Titanic was a Royal Mail Ship. This designation meant the Titanic was officially responsible for delivering mail for the British postal service. On board the Titanic was a Sea Post Office with five mail clerks (two British and three American) who were responsible for the 3,423 sacks of mail (seven million individual pieces). Interestingly, although no mail has yet been recovered from the wreck of the Titanic, if it were, the U.S. Postal Service would still try to deliver it out of duty and because most of the mail was destined for the U.S. Despite the fact that everyone knew the Titanic sunk and they had an idea of where that happened, it took 73 years to find the wreckage. Dr. Robert Ballard, an American oceanographer, found the Titanic on September 1, 1985. Now a UNESCO protected site, the ship lays two miles below the ocean's surface, with the bow nearly 2,000 feet from the ship's stern. The "Titanic" movie included "The Heart of the Ocean," a priceless blue diamond that was supposed to have gone down with the ship. This was just a fictional addition to the story that was likely based on a real-life love story regarding a blue sapphire pendant. Thousands of artifacts were recovered from the wreckage, however, and many pieces of precious jewelry were included. The majority were auctioned off and sold for some rather incredible prices. Though many of us know of the 1997 movie "Titanic" starring Leonardo DiCaprio and Kate Winslet, it was not the first movie made about the disaster: at least eleven have been made, depending on how you define "Titanic movie." The very first movie made about the Titanic disaster was released in May 1912, a month after the disaster. It was a silent movie called "Saved from the Titanic" and it starred Dorothy Gibson, an actress who was one of the survivors. In 1958, "A Night to Remember" was released that recounted in great detail the ship's fatal night. The British-made film featured Kenneth More, Robert Ayres, and many other notable actors, with over 200 speaking parts. There was also the 1953 Twentieth Century Fox production of "Titanic." This black and white film starred Barbara Stanwyck, Clifton Webb, and Robert Wagner and was centered around a couple's unhappy marriage. Another "Titanic" movie was produced in Germany and released in 1950. In 1996, a "Titanic" TV mini-series was produced. The all-star cast included Peter Gallagher, George C. Scott, Catherine Zeta-Jones, and Eva Marie Saint. It was reportedly a rushed production designed to be released before the famous blockbuster film hit theaters the next year.